Score is an extension of Kenosis, a project where I utilize the erasure and excision of the New York Times Newspaper to elicit a sacred experience of the everyday. For every score, I collect a particular news story as it travels each consecutive day through different sections of the newspaper. 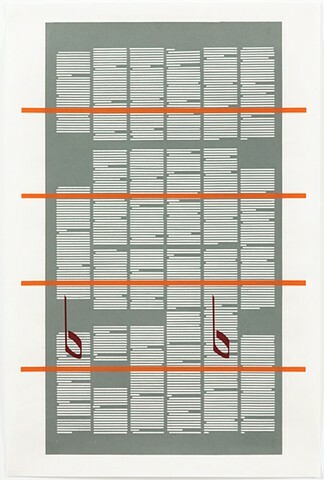 Sourcing commemorative paper cutting and illuminated musical notation, I excise the first image in a decorative manner. I remove the rest of the images and cut out the lines of text with an X-ACTO knife leaving behind only the rectangular headlines and pull quotes specific to the story. I am left with the underlying architecture of the narrative. The cut newspaper pages then double as stencils for a screen-printed, archival folio edition of the score. By printing a medieval clef and four-line staff over the page, the rectangular pull quotes and headlines in the final prints can be interpreted as musical square notes or neumes. Neume comes from the Greek word pneuma, meaning breath, spirit or soul. The tone of each note is dictated by where it falls on the staff. In reference to oral traditions of communication and prayer, I’m using melody as a preservation system for language. Each score can be read, performed and passed on as a chant. In this way, media content is translated into sound and breath. Capitalizing on the succinct nature of pull quotes and headlines, I then create lyrics. My ink drawings make the score notation portable.